Managing contact information within any company is a challenge, but we've made the task easier for those of you who rely on Gmail. Yathit joins the power of Gmail and SuiteCRM into one seamless experience when using Chrome, safeguarding your important contact information and bringing it out exactly when you need it. Instead of copying and pasting text from one browser tab into another, Yathit lets you create new contacts and leads with just one click, automatically capturing information directly from the message. Creating new contacts couldn't be easier. Quickly create or edit Leads, Contacts and Accounts. All editable fields are supported. Use InboxCRM's menu to display or hide specific fields. Click the provided link to view your new record on the SuiteCRM site. With quick access to all of your important contact information inside Gmail, you'll always be ready for any customer meeting, phone call or email. Easily view the activity feed, upcoming appointments and calls, pending tasks and cases. View sender or recipient contact information and history—automatically displayed on the right side—when reading any email, Hover over the email addresses to change the target contact to display. Keep up with your contacts via their social media updates and profiles, and see other public information they've shared online, all from within Gmail. Convincing everyone in your company to enter new data into SuiteCRM is always a challenge, but using Yathit ensures everyone on the team is able to easily contribute and benefit from using these tools. Your CRM is always available while viewing email in the browser, making viewing and updating records painless. New leads won't fall through the cracks when creating new records is so easy. All of your teammates, including the marketing department and sales reps, have access to the latest customer information every time they log in. Not only is InboxCRM smart enough to find all the right data in your emails, it even brings SuiteCRM's tools into Gmail, providing powerful data management in a convenient package. Meeting event data is synchronized between Google and SuiteCRM, so you won't have to worry about updating each service. See alerts and activity notifications from SuiteCRM in Gmail. Use any of SuiteCRM's email templates when creating new emails. Dynamic fields such as contact name and address are automatically filled in with your SuiteCRM and Google contact data. Quickly search all kinds of SuiteCRM records inside Gmail. The full-text search includes name, emails, phone number, title, record id and description. Directly archive Gmail messages to SuiteCRM. You can also upload Gmail attachments to the SuiteCRM document module with just one click. Track your sent emails with one click while composing any email. When your recipient opens the email, you will be instantly notified. Links inside the message can also be tracked, and tracking statistics are available on the Extension Options page. Yathit InboxCRM makes it easy to synchronize your SuiteCRM contacts with your Google Contacts. 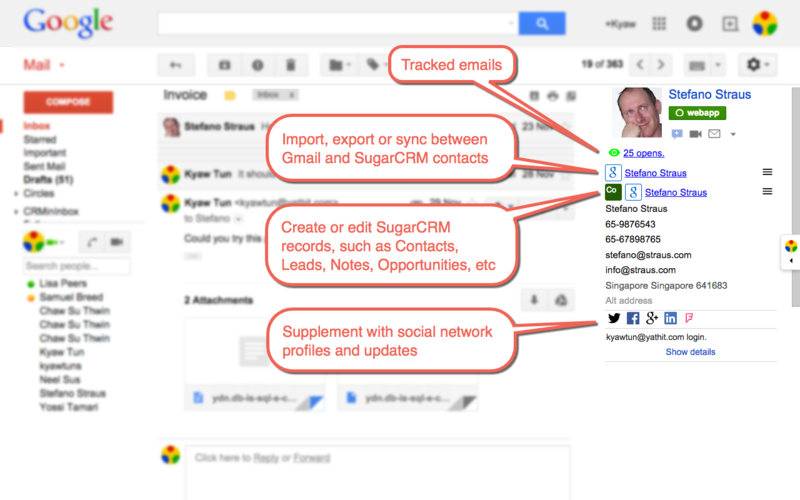 See all of your SuiteCRM contacts directly in your Google Contact list, automatically. No setup required. 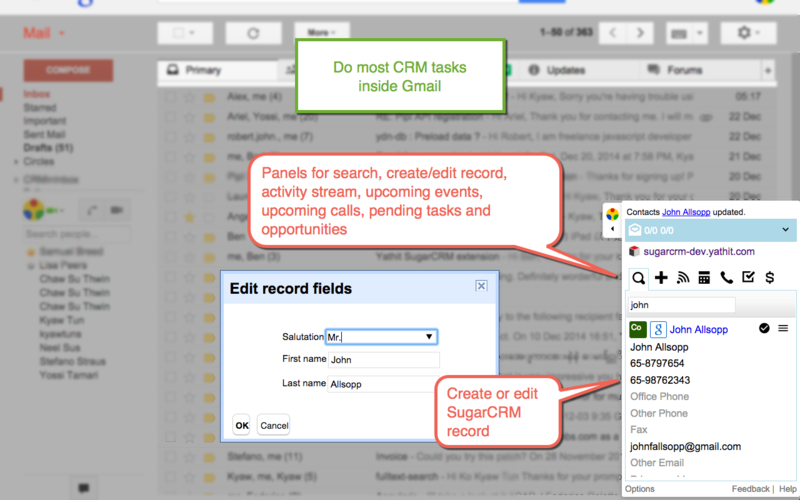 Yathit Chrome Extension is the best tool for integrating SuiteCRM with Gmail. Install it today!